The powertrain consists of a 530hp V8, 3.4litre, normally-aspirated petrol engine combined with a 300hp hybrid system. 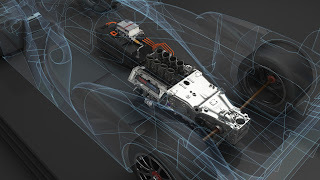 Under braking, in the designated hybrid recovery zones, the system harvests energy which is converted into electricity by the Motor Generator Unit (MGU), located between engine and gearbox, within the gearbox housing. This electricity is transmitted, via a DENSO inverter, into the NISSHINBO super capacitor storage device, sited next to the driver in the cockpit. When the driver accelerates, the hybrid boost is delivered automatically for around three seconds, with the electricity travelling from the super capacitor, through the inverter and into the MGU, which adds the power to that of the petrol engine and transmits it to the rear wheels.